Renfrewhire’s culture champions and event organisers showed their support for Paisley’s UK City of Culture 2021 bid as the town celebrated its first 2021 weekend â€“ Saturday 20 and Sunday 21 February - this year. Passionate culture enthusiasts joined in the cultural conversation - the first of many public engagement sessions for the town - and even brought along personal objects that represent what makes Paisley to them. 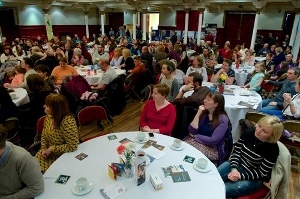 The ideas exchanged at the event will help to develop plans for a cultural programme of events as part of the town’s bid. Hosted by the Paisley 2021 bid team - in association with the Creative Renfrewshire Network - attendees also had the opportunity to give their views on the draft Creative Renfrewshire strategy. Renfrewshire’s schools and communities are gearing up for this year’s Fairtrade Fortnight which runs from 29 February-13 March and encourages people to examine the challenges facing workers and farmers across the world. People are encouraged to have a ‘Big Breakfast’ to help support farmers and workers to put food on the table for their families by harnessing the power of a Fairtrade breakfast. The Paisley Pattern was the star of the show during a cross-cultural fashion extravaganza featuring students from India and their Scottish counterparts. The show in Paisley Abbey 0n Friday, 22nd January marked a spectacular finale to a knowledge and skills exchange scheme based around textiles and design. A delegation from Glasgow Kelvin College travelled to Andhra Pradesh in India earlier this month and a group from the Government Polytechnic for Women in the city of Guntur jetted over this week for the return leg. 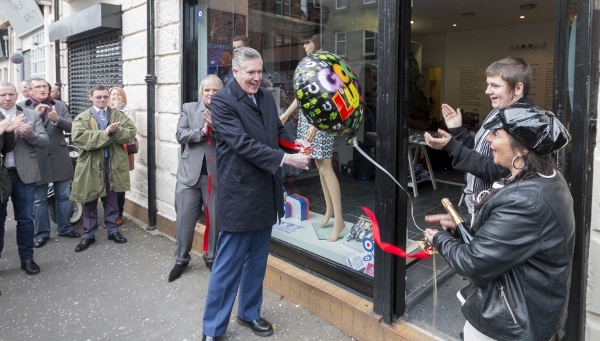 George Adam, Paisley’s MSP, cut the ribbon at the grand opening of Smithers Jones on Saturday, 27th February, a new clothes shop in Orchard Street, Paisley - specializing in Mod style clothes - and a few friends came too.